You’ve filed a petition for a divorce, but your spouse has completely ignored your communications and refuses to sign the papers. This is not as uncommon a situation as you may think. One spouse may feel the relationship has completely failed while the other believes it is still worth fighting for. Although Pennsylvania courts will not force you to remain in a marriage that you’re severely unhappy in, it does require you to convince your spouse to agree to a divorce, or else file a ‘fault’ divorce. If you find yourself in a situation where you and your spouse are not on the same page about getting a divorce, contact the divorce attorneys at Barbara Flum Stein & Associates immediately so that we can help you evaluate your options and start fighting for your rights. Your spouse has been institutionalized for at least 18 months and will not be discharged for another 18 months. As you can see, a fault-based divorce is a bit more complicated than a no-fault divorce. You will need to gather substantial evidence to support your ground for filing a fault-based divorce. If you and your spouse cannot get on the same page regarding a potential divorce, you essentially have three options: (1) file for a fault-based divorce on one of the grounds listed above, (2) convince your spouse to consent to a divorce, or (3) try to work out your problems and stay together. The divorce attorneys at Barbara Flum Stein & Associates have dealt with numerous situations in which two spouses were unable to come to an agreement about a possible divorce. 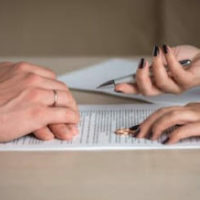 Our attorneys always speak with the spouse first to learn more about the reasons why one spouse wants to file for divorce while the other does not, and then consult the spouse on the best course of action for his or her particular situation. We can help you understand your rights and options during this difficult time and zealously defend you the entire way. Contact the Media divorce attorneys at Barbara Flum Stein & Associates today for a confidential and free review of your case. Call us at 610-565-6100 or visit us online to schedule your free consultation today.